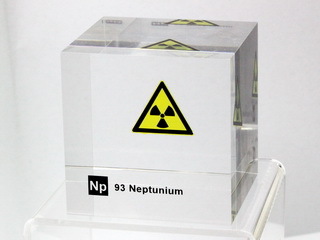 Neptunium is a chemical element with the symbol Np and atomic number 93. A silvery radioactive metallic element, neptunium is the first transuranic element and belongs to the actinide series. Its most stable isotope, 237Np, is a by-product of nuclear reactors and plutonium production and it can be used as a component in neutron detection equipment. Neptunium is also found in trace amounts in uranium ores. Neptunium (named for the planet Neptune, the next planet out from Uranus, after which uranium was named) was first discovered by Edwin McMillan and Philip H. Abelson in the year 1940 in Berkeley, California. Initially predicted by Walter Russell's "spiral" organization of the periodic table, it was found at the Berkeley Radiation Laboratory of the University of California, Berkeley where the team produced the neptunium isotope 239Np (2.4 day half-life) by bombarding uranium with slow moving neutrons. It was the first transuranium element produced synthetically and the first actinide series transuranium element discovered.